My kiddos love this shampoo and body was combo. We've also used it as a bubble bath as well. It has a nice light scent to it and leaves my kids skin and hair very soft. I love that it saves me space in the basket beside the tub that we keep shampoos and body washes in. It's one bottle for everything. It's not only convenient, but it's also a pretty big bottle so it should last quite some time. I think the label on it is very cute as well. 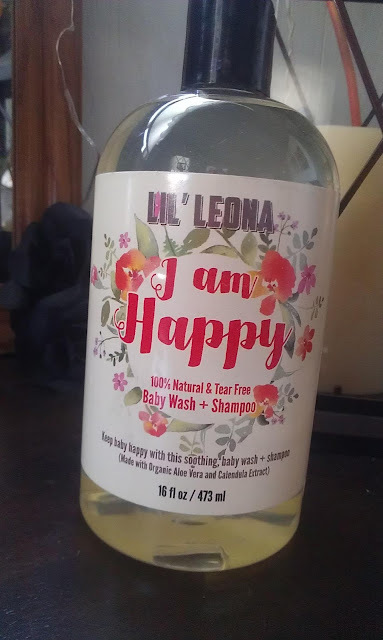 Lil Leona baby wash & shampoo made with all natural and organic ingredients and is 100% tear-free! Ingredients: Deionized Water Aloe Barbadensis Leaf Juice (Certified Organic) Sodium Lauroyl Methyl Isethionate (Coconut Oil derived) Cocamidopropyl Betaine Sodium Methyl Oleyl Taurate Lauryl Glucoside Coco-Glucoside Panthenol (Pro-Vitamin B5) Mixed Tocopherols (Vitamin E) Symphytum officinale (Comfrey) Leaf Extract Chamomilla recutita (Chamomile) Flower Extract Melissa officanils (Lemon Balm) Extract Phenoxyethanol Ethylhexylglycerin Calendula Extract (Certified Organic) Made in California, USA. It's great for those with sensitive skin, and I will be perfectly honest, I have used this myself and I love it! The scent is very soothing and my skin is super soft after I use it. Nice quality and I would love to see more from this company!